This is the film's most affecting and original sequence, in large part because it takes a persistent complaint against "Man of Steel"—that the supposed Boy Scout from Krypton was callously oblivious to collateral damage—and retrofits it, so that it looks like something “Man of Steel” always meant to do, the better to provide strong, simple motivation for Bruce. Re-traumatized by a 9/11-style disaster that kills dozens of his employees, including a young girl’s mother, he channels his anger and helplessness into a preemptive war against Superman, to be carried with biomechanical armor and Bat-tech fortified by Kryptonite. He sees Kal-El as a clueless and careless false god whose powers must be neutralized, lest humans get so comfortable with worshiping "aliens" that they set the stage for a takeover by more Zods. I keep referring to the cowled hero as Bruce because, more so than any Batman picture, “Batman v Superman” treats the Caped Crusader as a scary-awesome manifestation of ordinary neuroses, practically a lycanthropic rodent-beast who emerges at night, summoned by his own monogrammed spotlight-moon. In comparison, Superman seems a more balanced character: aside from the presence or absence of glasses or a cape and the stress of maintaining his cover story (he gets so preoccupied by an unauthorized investigation of Batman’s vigilantism that he starts screwing up his regular duties at the Planet), Clark Kent and Superman are essentially the same guy. Unfortunately, the script’s early promise recedes as the movie unreels. 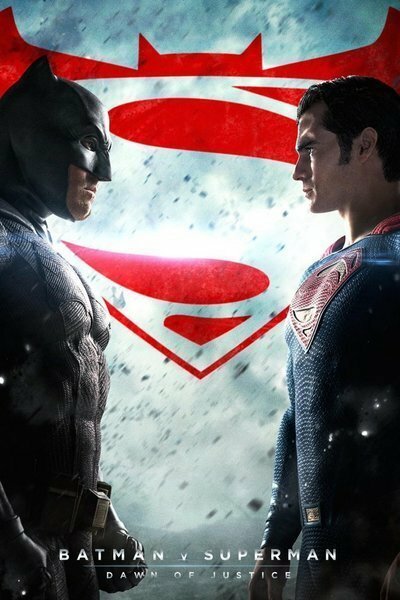 “Batman vs. Superman” is a disorganized, lead-footed movie that carries itself with unearned confidence; you see every card it’s about to play ten minutes before the movie plays it, yet Snyder doesn’t just slap each one down on the table with gusto, he keeps pointing to it and telling you what rank and suit it is. We surely would have surmised that the identical first names of Bruce’s dead biological mother and Kal-El’s adoptive mother—Martha—would come into play eventually, but the film is so worried that somebody might not get it that it has Thomas Wayne croak “Martha” with his dying breath, then finds ways to keep repeating “Martha” over the next two hours, building toward a reprise-flashback of Bruce’s parents’ murder that will bring latecomers up to speed. There are other repetitious touches along these lines, including multiple, vocal assurances that the characters are fighting in depopulated areas—a clumsy defensive strike against “Man of Steel” hand-wringing. It all seems pointless when you realize how little effort has been devoted to embellishing the characters in Snyder’s “Nashville”-sized cast, none of whom come alive as they did in Tim Burton’s or Christopher Nolan’s or even Joel Schumacher’s Batman pictures. Eisenberg’s Luthor might have been a fascinating third panel in the movie’s gallery of lonely and haunted man-children (in a harrowing moment, he rails against “daddy’s fist and abominations”), but he mostly comes off as a 21st century brogrammer, all tics and threats and unwanted physical advances. Adams’ Lois Lane is once again reduced to a poker-faced damsel in distress. Jeremy Irons’ Alfred isn’t a patch on Michael Gough’s or Michael Caine’s. Gadot, a lithe beauty with a musical accent and a steely demeanor, is granted less depth than a typical Bond girl. The movie shows little interest in explaining or justifying its knotted-up subplots, and its detours into franchise-building are often self-defeating. The most misguided is a dog-leg near the end: just when the story starts building up a head of steam, it pauses for a recitation of the DC heroes we can expect to see in the first full-on Justice League movie. “Batman v Superman” tries to compensate for these flaws and others through sheer scale and volume. It’s two-and-a-half hours long, louder than an airstrip at O’Hare, gins up “excitement” with shaky-cam footage and hyperactive cutting, and has both figuratively and literally dark images. Even its daylight scenes seem to occur at dusk, thanks to the way Snyder and his cinematographer Larry Fong bleed the color out and shroud the characters in smoke. Luthor’s mutant Kryptonian monstrosity Doomsday—spoiler warning not required; its presence was revealed in PR photos and promotional footage weeks ago—is a generic hell-beast, all ropy muscles, spiky encrustations, and Rancor-like teeth. Reports of a forthcoming “R”-rated DVD version aren’t surprising: the movie’s juicy stabbings, brandings-by-Batarang, close-quarters gunshots, scenes of sadistic kidnapping and torment, and generally despairing tone are Urban Thriller 101. The film is more effective when it’s channeling expressionist horror movies by filming action from disorienting angles and letting blood seep from strange nooks and crannies. When it borrows iconic designs and situations from its primary inspiration, Frank Miller's politically satirical, meticulously plotted graphic novel The Dark Knight Returns, it’s like a kid stumbling around in dad’s boots. There are a few brilliantly realized moments, the acting is mostly strong despite the weak script (Affleck and Cavill are both superb—Affleck unexpectedly so), and there's enough mythic raw material sunk deep in every scene that you can piece together a classic in your mind if you're feeling charitable; but if you aren't, “Batman v Superman” will seem like a missed opportunity. At times it might make you long for Christopher Nolan's delicate touch. Those last four words have never appeared side-by-side before. Life’s funny that way.